You made it! You’re all set for the Crystal-Pulling Parties on my personal Facebook page. And unless you unsubscribe from my list, you’re good to go for all future pulling parties as well–no need to register again. To get your stones pulled, you DO have to make your request in the proper post. I’d love to be able to find your message anywhere–in my email, on my fan page, off the thread on my personal page, in a FB/Messenger message–and go from there, but with the scores of requests, and the many daily hours I put in pulling for people (for free) and responding to their responses, I’ve just gotta ask you to follow this one simple rule. Thanks for understanding. Read all the way through the instructions, and then post your request. And feel free to tag people whom you love, and who would be open to/in need of receiving this kind of support. The more, the merrier! They can click on the link right on the thread. When I pull these stones for you, they are either telling you something (i.e. “follow your dreams”) or filling in an energetic gap, or both. If you get Rose Quartz, it’s both telling you to love more AND bringing more of the heart-opening that allows you to receive (and give) more love. Congrats–you now have everything you need to read your basic message from the stones that picked you (they choose you, not the other way around, even if you have your own hand in my bowl). 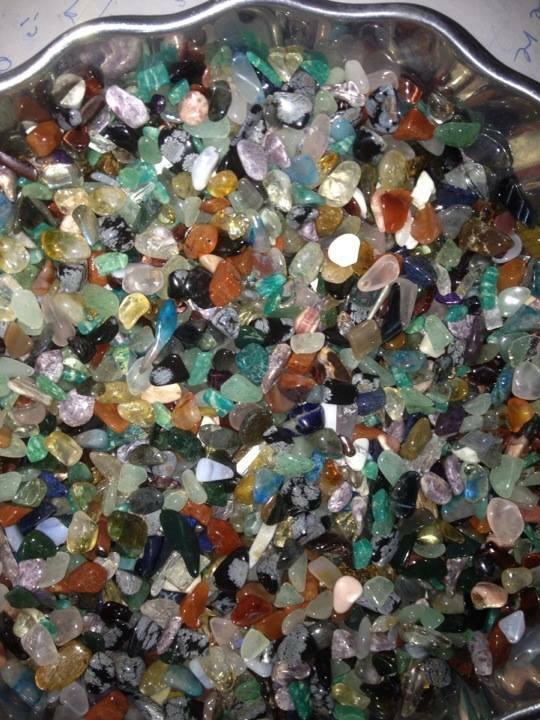 Of course, if this has really awakened a love of crystals and you want to know more–i.e., what it means to have double or triple stones of the same variety, what the chakra and elemental associations of each stones are, a much fuller description of all 28 stones, my no-fail step-by-step process for interpreting pulls including a sample interpretation from an actual pull that you can see in a photo–you’ll want to get the Earth Magick Essentials guide. It’s not too late. There’s a 6-page intro with my philosophy and 8 pages of tables with crystal info. Want a peek inside? 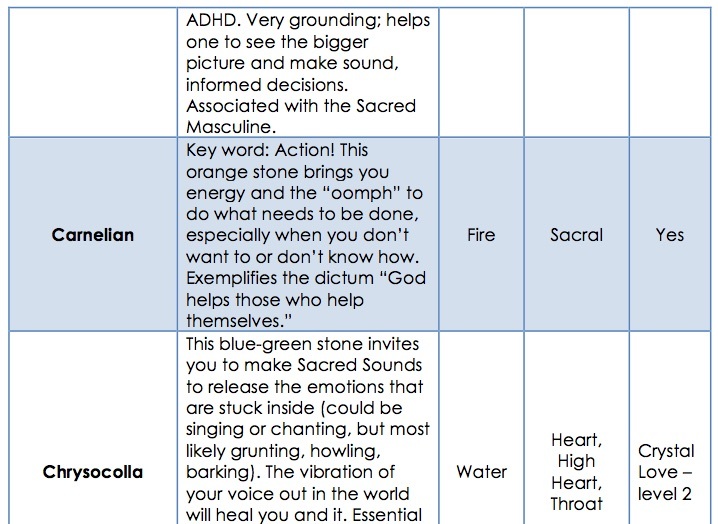 Here you can see the extended information about each stone, its elemental and chakra association and more, in easy-to-read tables in alphabetical order. The guide is a super-reasonable $17. You can use it over and over, every time I pull stones for you. 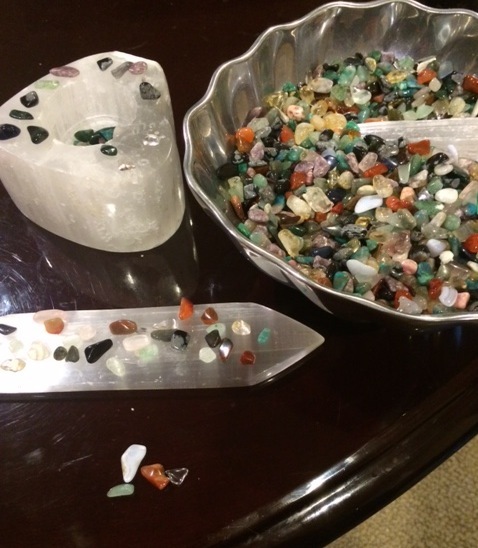 You’ll be quite the crystal connoisseur by the time you’ve absorbed it all! Thanks for playing with crystals with me, and I know you’ll love the energy. When you’ve read your message, be sure to post it in reply to the pull, and then tell me about how it resonates with you. (I love this work!) MWAH! Be sure to send your friends an invitation by tagging them directly on the thread.